Building automation can control 66% of energy in homes and building and since buildings consume 40% of all energy, building automation can control over a quarter of all the energy used in the United States. 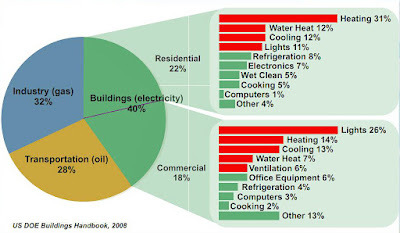 Commercial and residential buildings account for 40% of total energy consumption in the US. Same for CO2 production. 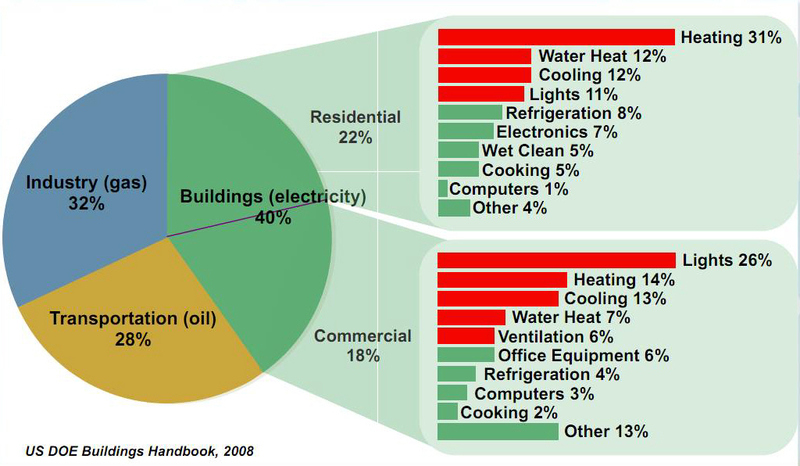 HVAC and Lighting account for 60% of commercial building electric energy usage According to Amory Levins, ~75% is wasted. ACH - Air Changes per Hour - The number of times per hour that the volume of a specific room or building is supplied or removed from that space by mechanical and natural ventilation. Air changes in a confined space are important for a variety of reasons, mainly though, we need fresh air to live. Without sufficient fresh air exchange, moisture is trapped in a room/home/building, molds can feed, and other allergens and excessive dangerous gases (e.g. Carbon monoxide, Carbon Dioxide, urea formaldehyde), can remain in the home. A new focus on energy efficiency is resulting in buildings more sealed from air transfer in and out making fresh air intake very important. AHU - Air Handling Units - - A device used to condition and circulate air as part of a heating, ventilating, and air-conditioning (HVAC) system. An air handler is usually a large metal box containing a blower, heating or cooling elements, filter racks or chambers, sound attenuators, and dampers. Air handlers usually connect to ductwork that distributes the conditioned air through the building and returns it to the AHU. Chiller – A machine that removes heat from a liquid via a vapor-compression or absorption refrigeration cycle. This liquid can then be circulated through a heat exchanger to cool air or equipment as required. Provides chilled water for cooling the building or for process needs. Types include: Centrifugal, Screw, Reciprocating and Absorption Moving water around a building is much easier than Freon. Controllable through demand limit. Coil - Equipment that performs heat transfer when mounted inside an Air Handling unit or ductwork. It is heated or cooled by electrical means or by circulating liquid or steam within it. Air flowing across it is heated or cooled. Condenser - A a device or unit used to condense a substance from its gaseous to its liquid state, typically by cooling it. In so doing, the latent heat is given up by the substance, and will transfer to the condenser coolant. - A component in the basic refrigeration cycle that ejects or removes heat from the system. The condenser is the hot side of an air conditioner or heat pump. Condensers are heat exchangers, and can transfer heat to air or to an intermediate fluid (such as water or an aqueous solution of ethylene glycol) to carry heat to a distant sink, such as ground (earth sink), a body of water, or air (as with cooling towers). Air-Side Economizer - Air damper that can save energy in buildings by using cool outside air as a means of cooling the indoor space when the outside air is both sufficiently cool and sufficiently dry. When no additional conditioning of it is needed; this portion of the air-side economizer control scheme is called free cooling. With the appropriate electronic controls, economizers can be used in climates which experience various weather systems. However, because they are generally not tuned, 50% in US cost more than they provide. Good controls, and valves or dampers, as well as maintenance, are needed to ensure proper operation of the air- and water-side economizers. 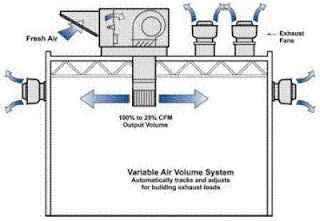 VAV – Variable Air Volume – Technique for controlling the capacity of a HVAC system. The simplest VAV system incorporates one supply duct that, when in cooling mode, distributes approximately 55 °F supply air. Because the supply air temperature, in this simplest of VAV systems, is constant, the air flow rate must vary to meet the rising and falling heat gains or losses within the thermal zone served. The fan capacity control, especially with modern electronic variable speed drives, reduces the energy consumed by fans which can be a substantial part of the total cooling energy requirements of a building. Dehumidification is greater with VAV systems than it is with constant volume systems which modulate the discharge air temperature to attain part load cooling capacity. Control of the system's fan capacity is critical in VAV systems. Without proper and rapid flow rate control, the system's ductwork, or its sealing, can easily be damaged by over-pressurization. Includes reheat coil, fan. Without a remote fan powered box, a centralized 100 HP Air Handler would have to be used. VFD - Variable Frequency Drive - A system for controlling the rotational speed of an alternating current (AC) electric motor by controlling the frequency of the electrical power supplied to the motor. Widely used in ventilations systems for large buildings, variable-frequency motors on fans save energy by allowing the volume of air moved to match the system demand. Variable frequency drives are also used on pumps, conveyor and machine tool drives. Big energy savings are often possible when the loads (for example pumps and fans) can be run at a lower speed when the maximum output is not required. Controllable by reducing speed. An efficiency improvement of 50% reduces the size of needed supply by half, or doubles the amount of functionality that a backup supply can support. In this context, rapid improvements in the electrical efficiency of facilities have value far greater than the economic value of its reduced consumption. Simultaneous Heating and Cooling - Occurs frequently in HVAC systems and represents a large opportunity for energy reduction. In systems with primary and terminal level temperature control the lack of coordination between control settings creates waste. Automatic control valves ‘told to close’ don’t always comply. Certain automatic control routines, even with DDC controls, can allow overlap on a transient or continuous basis. Some engineers hate ice storage because it is "less efficient" than stand-alone chillers. In the small picture, this is correct. An ice storage system will use 7% to 8% more kWh than a chiller-only system yet, overall, using ice reduces CO2 emissions and fuel use, not to mention save tons of money. According to the California Energy Commission, during the summer daytime peak, the electric power system is up to 15% less efficient mechanically (peaker plants vs. baseload plants) and thermodynamically (cooling towers and transmission and distribution are less efficient because of high temperatures). In terms of emissions, the on-peak system emits 40 percent more CO2 per megawatt-hour than off-peak. Thus, in spite of consuming more kWh, ice storage is a strong environmental and economic strategy. SEER Deficiencies - SEER is not a reliable predictor of energy performance in California or of demand reduction. PG&E states that the CEC report cited by TURN for the increase in SEER ratings is replete with statements about the inadequacy of SEER ratings in California. For instance, the CEC report states: Current HVAC appliance performance testing is conducted to national standards. Standard ratings for the seasonal energy efficiency ratio (SEER) are conducted at a maximum temperature of 82º Fahrenheit and treat dehumidification as equal to sensible cooling. In the hot dry climates of California, outside air temperatures over 95° Fahrenheit with 35% relative humidity is common. The current standards provide inaccurate assessments of energy requirements during peak periods in California and the Southwest. I am surprised that heating is so high. Especially because we don't use heating year round. I thought that lighting would be the highest in both areas.